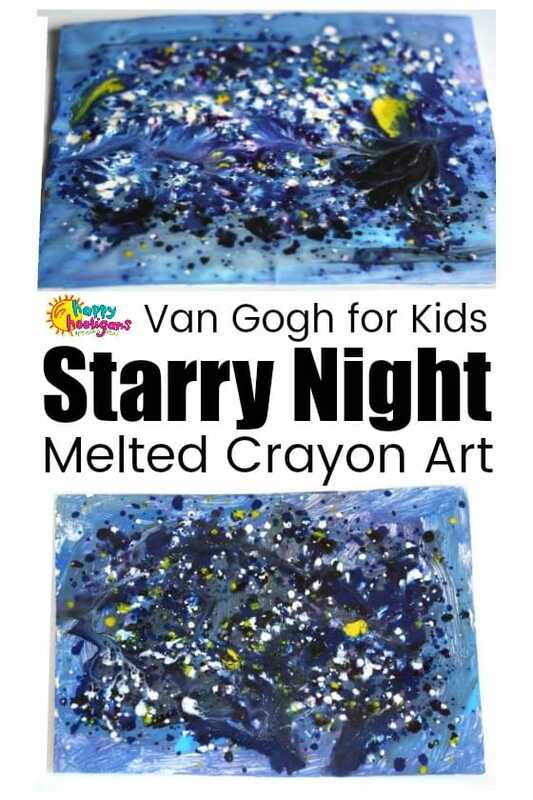 With this Starry Night Art Project, kids will have fun melting crayons in the oven to recreate Van Gogh’s famous masterpiece on aluminum foil! I’m really excited to share our latest daycare art project with you! 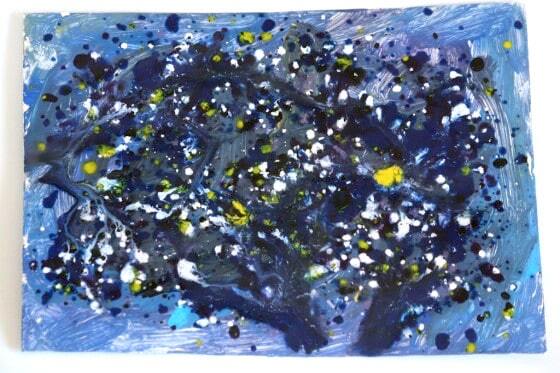 The kids and I melted crayons to re-create Van Gogh’s “Starry Night”, and the results were incredible! I was inspired to try some melted crayon art with the kids when I saw Dilly Dali Art’s melted crayon initials recently. I immediately wanted to try melting crayons for an art project with my daycare kids, but I wanted our project to be unique. Yesterday, I ran across our Starry Night jigsaw puzzle (Amazon affiliate link), and had my plan was hatched. 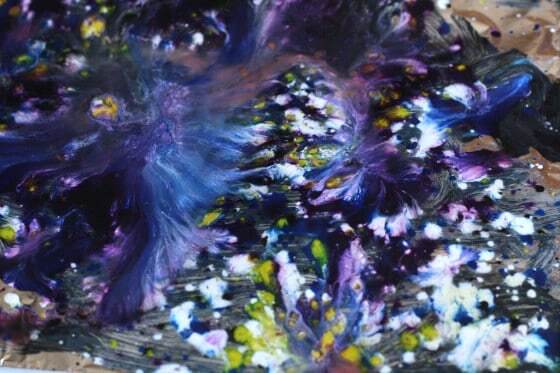 We would melt crayons to recreate the famous Van Gogh masterpiece. Like so many of the art and craft projects we do here in my daycare, I had no idea how this would turn out until the end of the process. I’m thrilled report that our results were fabulous. We chose colours that represented Van Gogh’s Starry Night and the way the crayon shavings melted, blended and blurred together, produced a better likeness to the famous painting than I ever could’ve imagined. And the best news? It was really easy to do! This art project provided me with an opportunity to introduce my toddlers and preschoolers to the famous artist and his well-known masterpiece. I began by showing the hooligans the picture on the front of the Starry Night puzzle box, and we examined the scene of swirling colours. We also listened to the song “Starry Night” by Don McLean. It’s such a beautiful song. Then, we got down to creating our Starry Night scenes. First, each child made a canvas by covering the panel of a cereal box with aluminum foil. Then, I gave them a paint pallet filled with 4 shades of blue paint, and a shot each of yellow, black, purple and white. They used this to paint their canvases. Some of the kids covered their canvases completely with paint, while some made only a few strokes. There’s no right or wrong way to do this. Allow your little one to decide when he or she is satisfied with their work. While our paintings dried, we prepared our crayons for melting. Begin by peeling the wrappers off your crayons. Tip for removing crayon wrappers: the easiest way to peel crayons is to soak them in warm soapy water for a few minutes first. Just rinse and dry after soaking and the wrappers should slide right off. Older children will be able to grate the crayons themselves, but it was a difficult task for my preschoolers, so we agreed that I would do the grating. 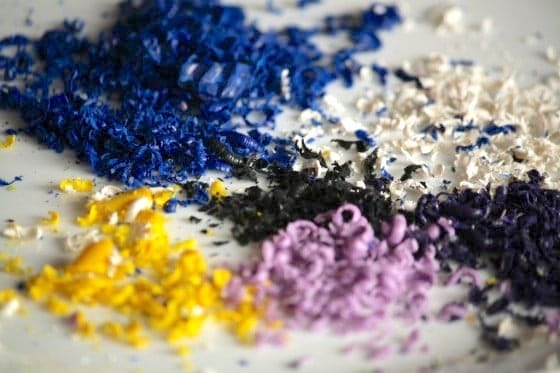 I made piles of blue, purple, yellow, white and black crayon shavings for each of the children. Next, sprinkle your crayon shavings all over your painting, leaving some space around the edges so they don’t run off the cardboard as they melt. Older children can strategically place their coloured crayon shavings where they want in order to achieve a certain look. Younger children can just scatter their shavings where-ever they wish. Next, place your art work on a baking sheet and put it in the oven for 5 minutes at 200ºF. 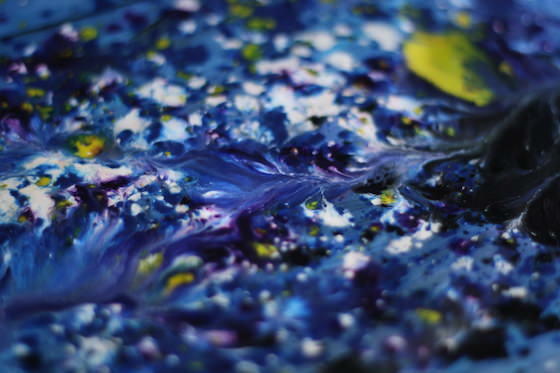 When you take your painting out of the oven, be sure to keep it level because your wax will be very hot and runny. The melted crayon wax will take a few minutes to cool. While it’s cooling, have the kids observe this fascinating process. Just out of the oven, the colours will continue to pool and run together, but within seconds, they begin to harden. Take care not to bend your painting or your wax will crack. If this happens, don’t worry, you can just pop it back into the oven and melt it again. We wanted to hang our Starry Night artwork on a wall, so I punched a couple of holes in the top of each painting, and added a dark blue piece of yarn so the hooligans would be able to display their masterpieces at home. 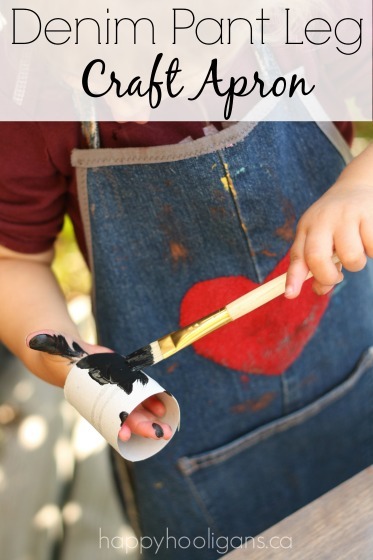 These Starry Night projects definitely something you and your child will want to display proudly! **Edited to mention: several years later, the Van Gogh melted crayon art that I made on this day still hangs on our playroom wall, and it still looks as beautiful as it did the day I made it! You can melt the wax with a hairdryer and use paper towels and an old toothbrush to remove, but an easier way to remove crayon wax from your cheese grater is to pour a kettle of boiling water over your grater. If you’re doing this over the sink, be sure to follow by pouring a kettle of hot water down the drain to flush away the wax. A better idea would be to put the grater in a pot of boiling water to melt the wax. Remove the grater and allow the water to cool so you can skim off the hardened wax. Thanks, Yvonne! I’ve seen the ones with the crayons across the top. Those are so neat! I’d love to try that one day. I’m not sure about the heat gun – I’ve never used one. It’s worth a try if you have one though! Oh my goodness, those turned out so cool! We’ll have to give it a try. Glad you liked them, Laura. Yes, you have to try them out. It’s such a neat process. Have fun! I think we will try this with valentines colors, thank you for sharing! I’m planning to do the same, Amy! Won’t that be gorgeous? What a fantastic effect. I can’t wait to see the Valentines colours! Glad to help, Inese! Have fun with it! I LOVE it! Now I have to go digging around for old crayons to grate up! Lovely job by the Hooligans! We love melting crayons so I bet they had a blast! Hit submit too quick! I’d love for you to come link these up at Mom’s Library! Have a great day! You and your hooligans are really fantastic, you are creating great artists! !We`ll try it this weekend, I think it�s going to rain a lot in Madrid. Thanks, Maria. Have fun with this! hi- love the idea!! but i was wondering- I read some of the comments but not all so I apologize if this is repeated. Do you think using real artists canvas would be possible? I would love to have something a little bit more substantial and permanent. I saw that someone suggested using a real canvas. I wonder if you could and apply heat from underneath with a heat gun or hair dryer. I may attempt as long as the air doesn’t blow easily through the canvas. I’m an art teach and could see my preschool kids loving this but I would have to recreate in a classroom. OOO so cool. I found this from the imagination tree linkup. We have a plastic grater which I think the kids can handle. trying soon. What a neat idea! I also like doing this in the oven vs. a hair dryer. Thanks for sharing. I have never seen this technique before. The results are stunning. Excited thinking about all the color combos you can do. Pinning now! These are gorgeous! This is bookmarked for when my hooligans are a little older!!! I wouldn’t try a blow dryer, Wendy. The crayon shavings would be everywhere as soon as you pointed the dryer at them. Love these! I was just picking up broken crayons up off the floor…this would be great! 🙂 Thanks! SUPER BEAUTIFULLY and wonderful. What a fantastic bit of art. LOVE Starry Night and your artwork and method is just fantastic. Thanks for joining in with Kids Get Arty. Very cool! Like some of your other commenters I think we’ll have to do this for Valentine’s Day. That’s a brilliant idea, Amy! We used one of those little hand cranked cheese graters. Worked like a charm. oh wow…thats awesome. 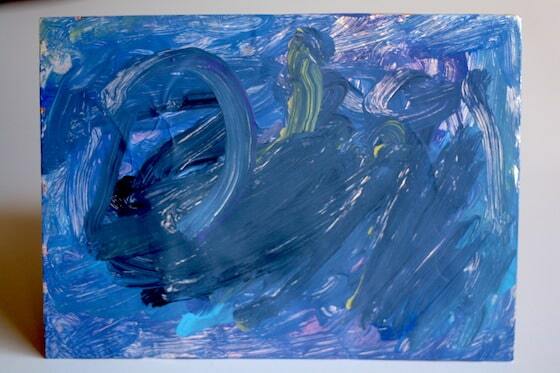 many pay lots of money for abstract art like that! Did you paint on the aluminum foil? Yes we painted on the foil first with acrylic craft paints. Thank you:) I love this. We are going to do it next week! I love this idea. I think we’ll head outside and see the real bright Texas stars then head inside the next day and try this out. Very creative! Great one! I love the way the crayons look. Thanks for sharing at Mom’s Library! Pinned. Still love this! Just stopping by to let you know I will be featuring it this week on Mom’s Library! Hope you stop by again! This is just magnificent. 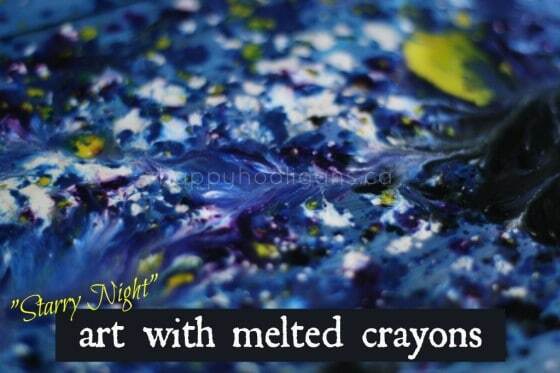 We love melted crayon art, and I really love the way you introduced Van Gogh to them. I am going to have to do this with my older boys. My five year old is especially obsessed with melted crayon art, and I think he will absolutely be thrilled. I will be featuring this tomorrow on The Sunday Showcase. This looks spectacular! What a very cool idea. So glad you all loved this one. I think this will go down as one of my all time favourites! We’ve done another one since the Starry Night project! Can’t wait for you to see it! It will be live on the CBC kids’ website on Feb.13th! I did this with my 23m old yesterday! We did a little bit of modification though and I wanted to share it with you! I was out of paints so we did a construction paper collage on the cardboard which turned out great. The other thing I did differently was breaking up the crayons by putting them in a bag and hitting them with a rolling pin. It was a lot less work and still made them into tiny pieces. You’re so inspiring and we use ideas from your blog often! Thank you so much and keep it up! Great ideas! I love it when we’re inspired by something we’ve seen, but we tweak it so it works with what we have on hand. Smart thinking to use the rolling pin for breaking up your crayons! I love this idea — our school celebrates one artist a month. Without an oven, we’ll have to lay them outside on a sunny day but I can’t wait to try it this summer! 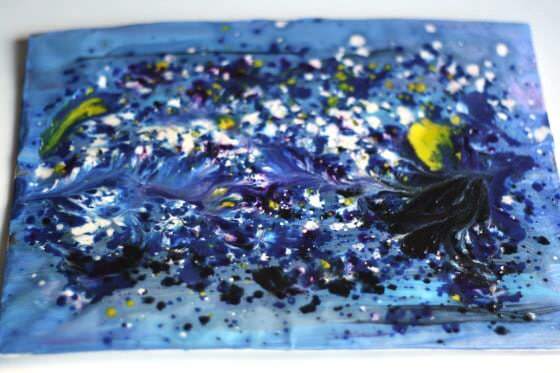 Is it perfectly safe to put acrylic paint and cardboard in the oven? At that low heat it is, Nikki. This is awesome – the process AND the product! We tried this with a canvas and then used a hair dryer to blow from underneath to melt the crayons. The canvas was thin enough to be heated from behind and it didn’t blow the crayon shavings away. 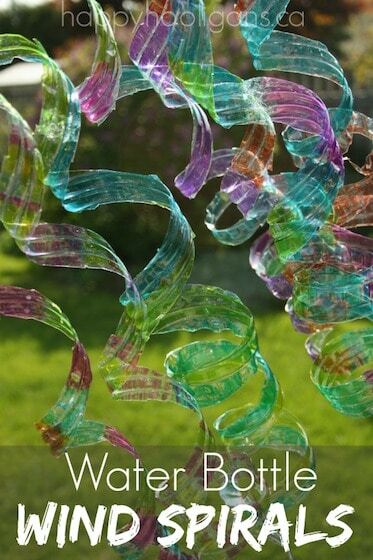 You have such fabulous ideas on this site, it is a source of inspiration for all the craft that goes on in our house. instead of using a grater we put the crayons in a sandwich bag and pounded the crayons with a hammer. I did this with my 10 yr old, 8 yr old and a 13 yr old neighbor. hello, can I poster paint? I’ve only ever used acrylics, Karoline, but I would think it would work with other paints. The only question might be whether the paint would crack and flake with the heat of the oven, but you don’t know until you try, right? Go for it. Thanks for sharing that idea. Looks beautiful. I just tried this with my 3 1/2 and 1 1/2 year old sons, and they came out so awesome! Thanks for this great idea. Yay! So glad you guys loved it, Kelly! No, Kara. It’s Farenheit. The lowest setting that my oven will go to. I just tried this and couldn’t get it to swirl. Looking at your photos it doesn’t look like you put that many crayon shavings on. Wondering if the problem is that I only had Rose Art crayons on hand. I might be. We’ve done it a few times now, and I think we use crayolas. Would this work if I had the kids color the foil with sharpies? All we have is tempera paint and I don’t want it to come right off. Also, not trying to have anything explode or start a fire. 🙂 please let me know ASAP as I am trying this on Monday. Hi Molly. I’m guessing you could use the sharpies. Or you could skip that step altogether, and just go with the grated crayons. I wouldn’t worry about anything catching fire or exploding though. The oven is at such a low heat and your art is only in there for a short time. Let me know if it works with the sharpies. You’re so welcome, Molly! I’m so glad you’re enjoying our activities! So I tried it out with the sharpies and it worked great… The kids liked drawing things behind it and didn’t use a lot of crayon so you could still see the background. Wonderful to hear, Molly! I’m so glad it worked for yoU! Starry night is my absolute favourite Van Gogh painting, love this and will definitely be trying this method. Thanks for the tip for washing the grater! We love to use our embossing tool to melt the crayons (it’s more direct than the hair dryer). 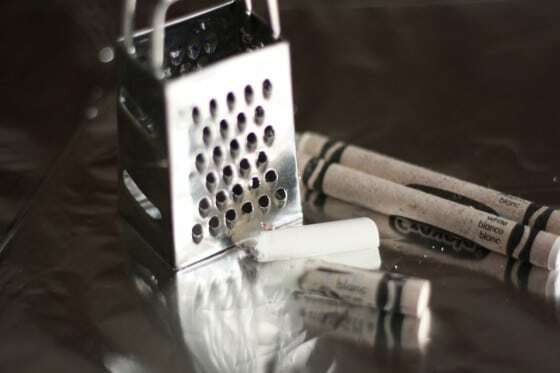 would suggest one uses a pencil sharpener to “grate” the crayons–safer forall, especially ssmall fingers of children. if this is a repeat of someone else’s suggestion, you have my apologies. Would a hairdryer work rather than an oven. Don’t have oven in room and would love for kids to see wax melt. I’m sure it would, but I’m wondering how you’d prevent the shavings from blowing all over the place. 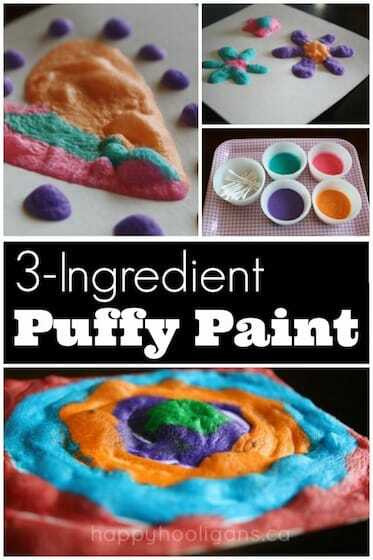 I can’t wait to try this with the girls nanny. Just making sure do the kids paint on the tin foil. They don’t have to, but yes, we painted on ours. Have fun! Any suggestions on whether we can varnish or seal our art? Also we used the Hershey bliss chocolate foil wrappers lol (gotta reuse or recycle right?). What kind of paint did you use, Sara? Tempera is known to flake and peel. Acrylics do not. If you used temperas though, they’ll run and smear if you brush on a sealant, as they’re waterproof. You could try a spray varnish, but I’m not sure if the wax would resist it. Wish I could be of more help… Sorry! Is there any way you could use a medium other than foil? Thatt way you could melt in microwave. Me and my girls 8 and 3 did glass ornaments with crayons. I tried the grater first then found that a pencil sharpener was easier for the girls. When teaching elementary art grades 1-6, I would use an old cheese grater for shredding old crayons. However, that can take a toll on knuckles and fingers. Myyy solution: crayon/pencil sharpeners! The cheap plastic ones with a storage cup attached. Ooooh, and my 6th grade art helpers. They loooved shredding crayons! You could even control the colors and keep colors separated in little margarine tubs. I bought an old plate warmer at a tag sale for a dollar. Plug it in, it heats up nicely, and the boys can color directly on paper for melty, swirly colors, or just place it on the warmer to melt the shavings. Thrifty and fun! can we use any other ways to melt the crayons other than putting them in the oven? I’m sure you likely can. Let me know what you come up with! 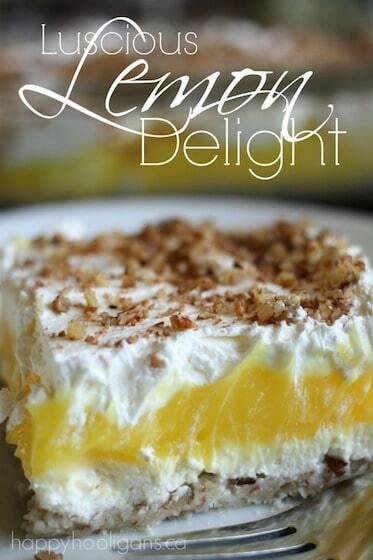 Oh wow, wow, we have to try this version! 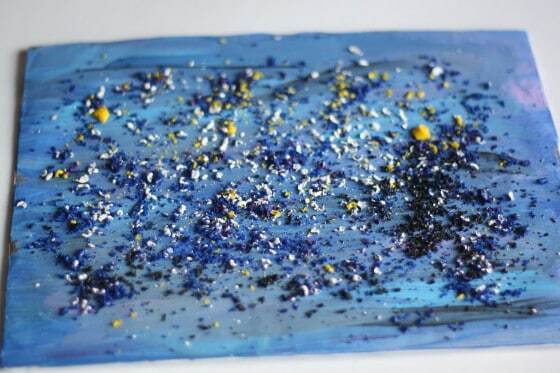 This is one we have not tried, while recreating our own Starry Nights with playdough, store bought, homemade with buttons and glow in the dark playdough, paint, but melted crayons: We are SOO doing this one! My daughter looks when I say that and says oh no, starry night again? LOL YUP, again! So excited. As we get ours done, I will come back and share a link! Thanks again. Sounds like fun! Give it a try! No, either side will work, Yen! Also, is it possible to use tempera paint on this art? You might be able to. I haven’t tried, Yen. Sorry! Absolutely love this! Glitter was a great addition. I didn’t keep a close enough eye though and the crayons melted a little too much and went flat. When using the pencil sharpener the shavings are very thin so keep that in mind. We will be doing this again and I think use shavings AND larger pieces to add texture. My 8 year old said ours looks like galaxies which I love! would it have to be done on tinfoil? could it be done on paper? would that make it more “stable”? I don’t think it would be anymore stable – the melted wax is quite thin and runny. I also think the oil in the wax would be absorbed into (and stain) the cardboard or paper without the foil there to protect it. An idea of how kids can make their own crayon shavings without grating their fingers off – I remember that as a child I loved to make shavings of wax crayons using a pencil sharpener. Since the crayons are softer than wooden pencils it’s quite easy to turn them while your fingers are still on the small side and the process of creating this thin layer of something that is no longer a crayon now was really fascinating to me. I guess the shavings might come up pretty big this way, so they might need to be broken up using a butter knife or a popsicle stick or whatever works. That sounds like a terrific activity leading up to creating the art, Kate! Thanks! Wonderful idea and the kids loved doing it. Only slight blip, was you oven on 200 c or f? Mine was at 200c. And after 2mins the kitchen was filled with smoke and the wax had splattered everywhere! Fun activity but the cleaning afterwards was not so fun. Oh no! Yes, it’s fahrenheit. I’ve edited the post to clarify that. I’m so sorry about your experience!